Looking for a way to spend a fun, memorable night out with your friends? Start off this month at these thrilling theme parks. Prices vary from each theme park and each bring a different feeling of excitement. 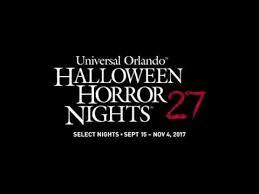 At Universal Studios’ Horror Nights, there is so much to see. The mazes include “Titans of Terror”, “Saw: The Games of Jigsaw”, “Insidious: Beyond the Further”, and many more. Not only are there mazes but also new Jabawockeez show, The Walking Dead Attraction and the terror tram. You can save up to $26 (prices depend on date). Six Flag’s Fright Fest includes haunted attractions, entertainment, and scare zones. Some mazes include “Dead End” and “Red’s Revenge”. Their “Club 6-Feet Under” will have you jamming with your friends and their “High-Sierra Hypnotist” will have you amazed. Prices depend on which ticket is purchased but vary from $17 to about $399.99. This is the largest park that engages with Halloween activity in SoCal. It has about 9 mazes, 4 scare zones and 3 shows. Their tickets are as low as $42 but raise up depending on which ticket is purchased.